How many times have you visited a site, landed on their homepage and thought wtf, how did I get here? Man, if I had a nickel for every time that has happened. There are numerous sites out there that just do not understand the importance of their homepage. Maybe it is just me, but I often refer to a website as a book or a magazine, and part of the reason a book or magazine can be appealing is because of the cover, or in this case the homepage. Homepage optimization, and not just for search, but for your visitors can be the foundation to becoming an online destination of choice. The homepage is arguably still the most important page on your website. Chances are this is the page that users will come to based on their search queries (either branded or non-branded) depending on how well your site is optimized. Now, before I proceed, I must say that the subject matter of this post is based on my experience and largely on my preferences. I have had a lot of success in assisting client with their online marketing efforts from an organic (natural) search perspective, so I must be doing something right. There are lots of other examples out there as well. So what separates the homepages of these sites? Why are there so many big brands that have a terrible homepage? Well perhaps it is because so many of these brands were either too early to develop their online presence or are just now catching up to where they should be. Regardless if site owners would just take some time and follow some best practices when it comes to their homepage, the 'Net would be a much cleaner and nicer place. There are some fundamentals that should be considered when designing a homepage. Find the Balance Between Design / Usability & SEO - quite often the focus is on only one of these items, as a result the homepage suffers. Avoid having your design team dominate the conversation, be sure to factor in things such as usability and SEO. Branding is Important - little things like company colors and the company logo can go a long way when it comes to designing your homepage. Navigation - be sure that the homepage features clear and intuitive navigation from the homepage. you might want to consider avoiding having too many navigation elements on the homepage. Conversely we have seen examples of sites where their homepage is in essence their sitemap which is not always a bad idea either. 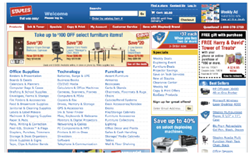 Staples is an example of such as site. Ensure that your homepage features some intuitive main navigation (such as a top nav bar) and includes a link to your sitemap (and not to your XML sitemap). Content is your Friend - what is the big fear about having content on your homepage? Really, if this is the only page that a potential customer will engage with, you had better be able to answer their questions or concerns. You need to educate them as to why your company can solve their pains and how you can address their needs. It does not hurt to have a paragraph of a minimum of 100-150 words on your homepage. Without being spammy, considering leveraging relevant keyword placement for your most important key phrases on your homepage. On-page optimization needs to be a factor with the content that you display on your homepage. Title Tag Optimization - the homepage is probably the only page on your site where the title tag should feature your brand early followed by relevant keyword second. Typically, this is opposite to how your title tags should read for your internal pages. Avoid Having Two Versions of Your Homepage when possible - some will use a Flash version along with a static version of the homepage. While there might be some examples of when you should do this and when this may be acceptable I say, why confuse the user? Present them with a single homepage unless it is absolutely necessary to have a "split" homepage. Page Load Time / Coding - here is one for the SEO folks. Try to avoid having excess coding on your homepage. Try to have clean coding and optimized page elements so that the page load time of your homepage is not affected in a negative manner. Avoid things such as large Flash files and large images. Have a minimum of one clear call to action above the fold - this could be in the form of a unique toll free phone number at the top of the page or a "click here" to download a white paper button. If you want the visitor to take an action on your homepage, help them out. Test Elements of Your Homepage - and finally, without getting too "crazy", test elements of your homepage. You probably do not want to get too drastic, but try variations of content (that can be crawled and indexed by the search engines), leverage your prime real estate. Your website can be a great tool for your business. As such you want to keep it polished as best as you can. Just like your front lawn of your property, you should take pride in your homepage and find that nice mix of aesthetics and usability combined with some SEO 101 and your homepage should be well received by your site visitors. Planning an upcoming website redesign? Consider carefully planning out what you want your homepage to look like and more importantly, what you want it to accomplish.